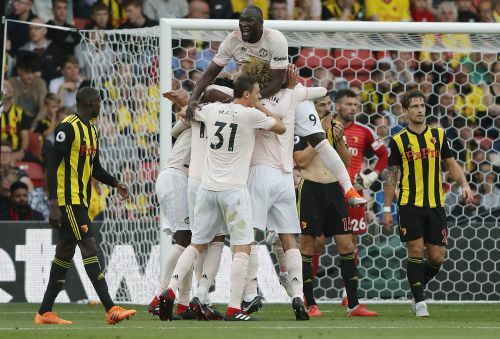 WATFORD, England (AP) — Manchester United ended Watford's unexpectedly perfect start to the English Premier League with a 2-1 victory in the fifth round on Saturday. Romelu Lukaku and Chris Smalling scored inside three minutes in the first half and Jose Mourinho's side had to withstand a second-half fightback by Watford. It then took David de Gea's fingertips save from Abdoulaye Doucoure's header to ensure United claimed a third victory of the campaign. "I am very happy with the spirit," United manager Jose Mourinho said. "I feel a bit frustrated because we had everything in the first half." But only two goals. Lukaku steered Ashley Young's cross into the net with his chest in the 35th minute. The lead could have been doubled almost immediately with former United goalkeeper Ben Foster pushing over a strike from Paul Pogba. This time Young's corner was sent deep into the box, with Marouane Fellaini's knock-down skillfully controlled on the chest by Smalling, with the defender on the turn then sending the ball past Foster. "If we played the second half the way we did the last part of the first half we would be in this moment with a completely different result," Mourinho said. "The beginning of the second half we let the game go down in intensity and stopped being aggressive. We gave them the chance to be reborn, score a goal and give us a difficult match."